Red Bull team principal Christian Horner says he is hopeful engine supplier Renault "have addressed their reliability issues for 2010". Red Bull have decided to stay with Renault after the French car maker secured its future in the sport. Horner said he had looked at other options but told BBC Sport sticking with Renault was "the best option". He added that he was also hopeful governing body the FIA would ensure parity between the rival engines. Red Bull were critical of the performance and reliability of the Renault engine in their later stages of their championship battle with Brawn last season. F1 nominally has an engine development freeze in operation, but some manufacturers have found ways of tweaking their V8s within the rules to find more performance. Renault were allowed to improve their engines over last winter, but are believed to have slipped behind standard-setters Mercedes again during 2009. "The problem with the freeze is that you freeze advantages and disadvantages and it was agreed amongst the teams that the engine should not be a performance differentiator," Horner said. "Therefore we rely on the FIA to ensure reasonable parity." Renault has supplied engines to Red Bull since 2007, with Red Bull enjoying their best season in 2009, recording six race wins and finishing second in the constructors' championship. However, they had been forced to wait before finalising future plans as Renault had considered leaving the sport. But a deal has been struck for the Renault team to continue racing - albeit with a minority 25% holding alongside investment firm Genii Capital - with the French car maker retaining total control over its engine manufacturing base in Viry-Chatillon on the outskirts of Paris. Horner insisted planning for next season had not been affected by the delay in signing an engine deal. "Being an independent team and at a junction in our contract which permitted change for 2010, it was only natural that we looked at all the available options," he said. "But we concluded that Renault, whom we've enjoyed a fruitful partnership with, was the best option for the team. "Internally we reached a decision some time ago and were awaiting Renault's commitment for their participation in 2010, therefore the design [of the car] hasn't been affected." Renault's reliability issues arose just as Red Bull were building pressure on Brawn and their driver Jenson Button during the summer. Vettel used two engines at August's European Grand Prix alone and had to restrict practice at the Belgian Grand Prix in order to protect a recycled one, just missing out exceeding the limit of eight engines in a season. "We had some road failures on Sebastian Vettel's car and none on Mark Webber's car," said Horner. "Renault handled the situation extremely well, enabling Sebastian to finish the season without a penalty. We are confident that they have addressed their reliability issues for 2010. "We've enjoyed a close relationship with Renault, which culminated in our most successful season to date when we finished second in the constructors' and drivers' championships. "We achieved six GP wins and four one-two finishes, therefore continuity not only with drivers and team personnel, but with the engine is important for 2010." Horner is confident that Renault's new ownership structure will not be an issue for his team, adding: "Our agreement is directly with Renault Sport." Renault F1 team president Bernard Rey added: "We are extremely happy with the way they work with us and are looking forward to continuing our fruitful partnership with Renault in 2010. 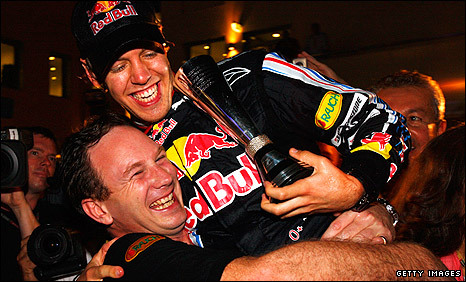 "We can confirm that our productive partnership with Red Bull Racing will continue in 2010. "The close relationship between Renault and Red Bull Racing has grown since 2007 - and this year it resulted in six victories and second place in the 2009 Constructors' Championship. "Together we believe we can build on this success and contribute to Red Bull Racing's future endeavours."